This image depicts the journey of India's Mars Orbiter Mission, the country's first interplanetary mission. The Indian Mars orbiter will arrive at the Red Planet on Wednesday, Sept. 24, India Standard Time (late Tuesday, Sept. 23, U.S. Eastern Time). India's first-ever mission to Mars is ready to make its historic arrival this week, hot on the heels of a NASA probe that just reached the Red Planet on Sunday. After a 10-month trek, India's Mars Orbiter Mission (MOM) is expected to reach Mars on at 7:41 a.m. India Standard Time on Wednesday, Sept. 24 (that's 10:11 p.m. EDT on Tuesday, Sept. 23) after a firing its engine for 24 minutes to enter orbit around the planet. Confirmation of the success (or failure) of this crucial maneuver should come to ground control minutes later, mission officials have said. "Uploading of commands required for Mars orbit insertion has been completed," ISRO officials wrote on Wednesday (Sept. 17). India's MOM spacecraft is arriving at Mars just days after NASA's Mars Atmosphere and Volatile EvolutioN spacecraft, or MAVEN, which entered orbit around the Red Planet late Sunday night (Sept. 21). Like MOM, the MAVEN probe will study the Martian atmosphere, but its goal is to understand the behavior of atmospheric elements in the upper reaches in response to solar activity. The $74 million MOM mission is primarily a technology demonstration, designed to show that India has the know-how to get a spacecraft to Mars. Another goal is to examine the surface of Mars and scan the Martian atmosphere for methane, which here on Earth is produced primarily by living organims. MOM launched on Nov. 5, 2013 and made six swings by Earth to pick up speed before zooming out toward Mars on Dec. 1. Midcourse corrections took place in December and June, according to ISRO officials. The solar-powered spacecraft will have to insert into Martian orbit while in the planet's shadow. This means that MOM will run completely on battery power while performing Tuesday's crucial engine burn. MOM will also experience a communications blackout at the time, but ground controllers likely couldn't make any adjustments during the burn anyway; the one-way communication delay between Earth and Mars at the time will be about 12 minutes. Diagram explaining how India's Mars Orbiter Mission probe will attempt to enter orbit around the Red Planet on Sept. 23, 2014. MOM will begin rotating to the correct orientation about 21 minutes before the burn, which starts at 9:47 p.m. EDT Tuesday (0147 GMT and 7:17 a.m. India Standard Time on Wednesday). 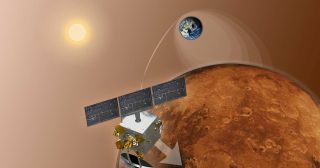 The maneuvers should place MOM into a three-day elliptical orbit around Mars, with the closest approach to the planet being about 262 miles (423 kilometers). The orbit's maximum height above Mars will be roughly 50,000 miles (80,000 km). To prepare for this crucial burn, ISRO commanded MOM to perform an engine test firing Monday (Sept. 22) to ensure everything is working correctly after 10 months of deep-space travel. The engine test went smoothly, according to an ISRO update. Indian space agency officials will host a live webcast of the Mars Orbiter Mission's arrival at 6:45 a.m. India Standard Time on Wednesday, Sept. 24 (that is 9:15 p.m. EDT on Tuesday night, Sept. 23). To follow the webcast, visit the India Space Research Organisation website.